When my father says, “Geoffrey, you really don’t understand,” he’s probably correct. The family can only guess the impact his physical conditions bring to daily life. I started to list some of them, then backspaced. You don’t want to know. Life at 92 is challenging. Among his biggest problems, deafness. Without hearing aids, nothing. With hearing aids, not much better. He can’t understand my sister on the phone at all. 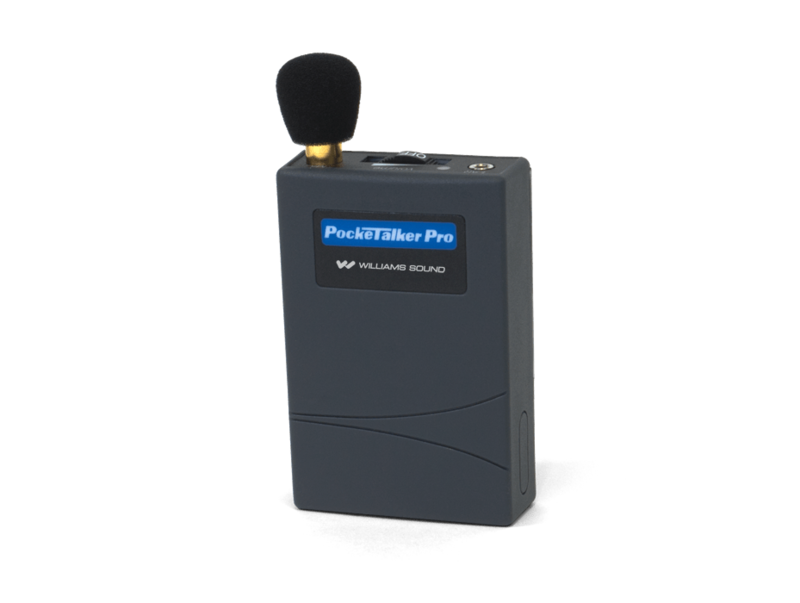 Two weeks ago, in the hospital and struggling to hear, the staff there let him use a PocketTalker Pro from Williams Sound. My sister Trudi ordered one from Amazon. His life has changed. 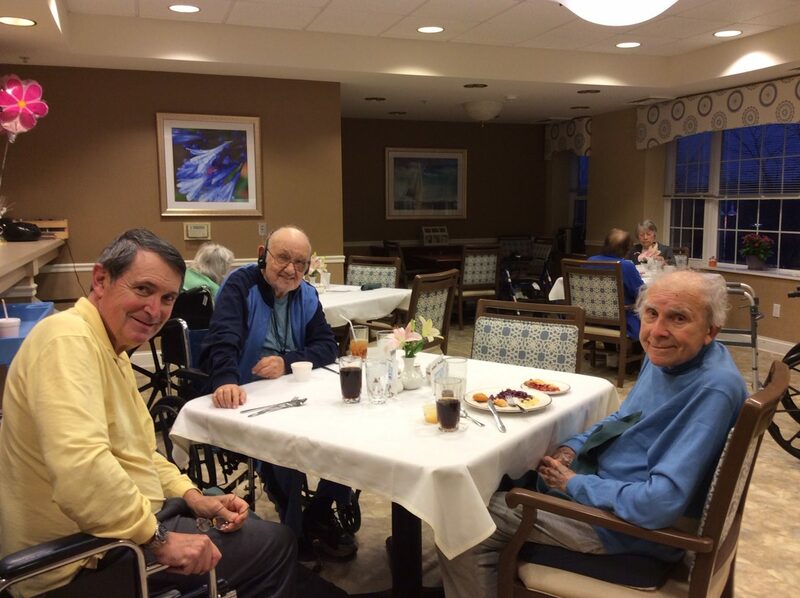 That’s a photo of my dad having lunch with the guys. It’s like he’s been sprung from prison. He ate alone in his apartment because he couldn’t converse. Now he can. He’s in rehab the rest of this week. They want him stronger so he’ll better avoid falls. He says physical therapy he’s receiving is having a good effect. He’s back home and ready to talk to the neighbors next week. So happy for your dad. My best friend is 16 year older than me and even with hearing aids, she can’t hear well. Jut went to the audiologist and a hearing test howled her hearing has deteriated some more. She’s going to get something with head phone like your dad so she can hear the TV without background noise. I feel very bad for her because she misses much of the conversation around us. Now THAT is technology at it’s BEST. That’s great news Geoff. My Mom at 100 went into the bathroom without her walker and tee-tottered and plopped herself on t he floor, she was about 100 lbs but I had to call my neighbor for help to pick her up and put her in a wheelchair and then I could handle the rest. I did, I fed her her dinner and put her to bed. This continued for a week and then she started to tell me her back hurt. So I called my doc and he said call and ambulance and take her to MidState for eval. Well I spent 9 hours there and then they told me they were transferring her to Hartford. 3 days and then they tell me she had fractured her coccyx, a compression fracture. So they sent her for therapy at Coccomo in Meriden and everyday they had her up and walking and I thought this is good, but then they transferred her to the other side and that was the beginning of the end. She turned 101 and died a month later. She was ready as she would tell me so. I often think, did they do the right thing? The worse part of this story is that she died 6 months after my husband died suddenly. She lived with us for a long time. I wish for your Dad to do well, Mom was deaf too, he is 92 and when she was 92 she was still doing laundry. So God Bless You and Your Dad. My 10th year for Breast Cancer is coming up in May and I should be discharged at that time. Oh, I am 85, I do a lot. All I can say is go for it Geoff’s Dad! You only live once. Keep up the good work! My mother lived till she was 99 and the last couple of months of her life was not good. But before that she was very active! I am so glad your Dad discovered the apparatus that the Universe sent him! May he enjoy many more of the good things life still has to offer him at 92.
of hearing his world after all this time!! Thanks for sharing this Geoff. The gift of sound! Oh how I wish my Dad had had something like this. He also was cut off because of his hearing impairment. Even with hearing aid he could not hear any of us. And talking on phone was impossible. Put that together with macular degeneration, and people assumed he had dementia. When, in fact he was very much ‘with it’. Life was so lonely for him. He died at 98 still with great mind but unable to communicate because of hearing and sight disability. So happy for you and your Dad. Sounds good to me, Geoff. I’m going to try it. I’m 82, no hearing aids, but definately hard of hearing. Thanks for the information. Good luck to your Dad! God bless him! So glad he’s dining with others again and enjoying himself.